"Muchas gracias por el tiempo invertido en preparar y enviar mi pedido......"
price: (Retail)	176,18 € tax incl. Spectacular druse of amethyst from Uruguay. This beautiful amethyst druse presents irregular and angular format. Its purple color is soft. The back is quite flat and the druse can be positioned standing or lying down. It is a unique amethyst druse, a gift of nature. 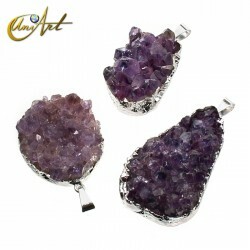 Amethyst tumbled stones in packet of 200 grs.